As you can see from the title, todays post is my little giveaway! Some of you may know, that my berry filled blog turned 1 years old on Saturday! I knew I wanted to reward my readers and say thank you for being so supportive, it just makes me sad that only one of you will win, but hopefully there will be more giveaways coming up in the future. I am really struggling right now, having this amazing lipstick in my home. I will be surprised if I don’t end up using it before the giveaway ends, and if so I will have to nip out and buy another one for you guys! It is just SO BEAUTIFUL. I need it in my life. PLUS I have heard amazing things about the formula. The CLASSIC berry lip, perfect for this time of year. The Barry M nail paint doesn’t really need an explanation. I mean… this nail paint inspired me to even come up with the name Very Berry Cosmo, so it really is a very special product to me! A big thank you for always being so lovely, and being just amazing readers. Every comment, tweet, email makes my day, and I am just so so grateful for everything. I wish all entrants a big good luck, I wish I could buy you all some lovely berry treats. UK entrants only. Both products in this giveaway have been purchased with my own money. The giveaway will run for 3 weeks from 12:00am 27th October to 12:00am 18th November 2015. Winner will be randomly selected through Rafflecopter – with all mandatory entries completed. I will contact the winner via Twitter or email within 7 working days of the competition ending. If the winner does not respond within 5 days, I will randomly selected another. Previous Post LIFESTYLE | VeryBerryCosmo’s 1st Birthday! lovely giveaway! my make-up look would be some gold/bronze eye shadow and maybe some liquid eye liner. Ooh I've been dying to try Glastonberry, what a lovely giveaway! Congratulations on a year of blogging, and long may it continue. WELL DONE ON A YEAR! yay, celebrate. 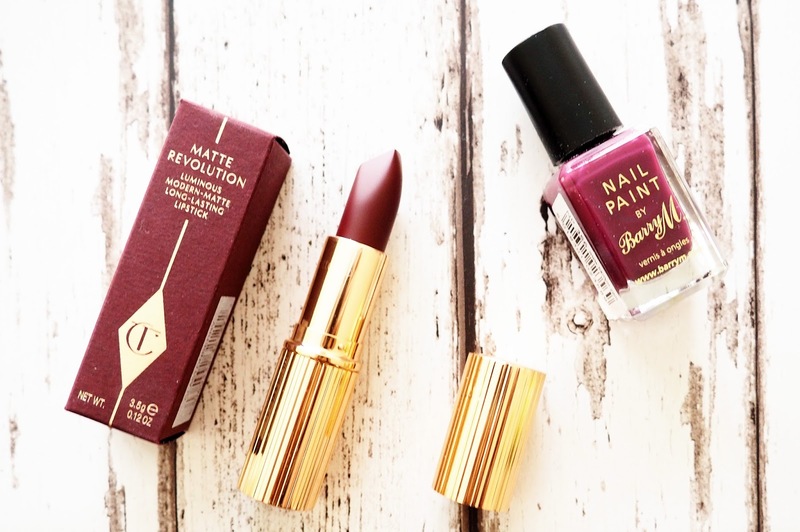 This giveaway is a gorgeous one, that lipstick and nail colour is amazing! BUT YAY HAPPY BLOGIVERSARY LOVELY! I think this is a fantastic giveaway! I think a golden smokey eye would go perfectly with glastonberry, or maybe even a bare eye look! Congrats again on one year!! I think I'd let the lipstick do that talking and just whack on a little eyeliner and mascara! I would wear a gorgeous gold eye with that lippie! Happy Blog Birthday! I'm so glad that you decided to start your little space on the net a year ago. And I'm so glad we all started talking (almost!) a year ago. I can't imagine my life without you guys! This is gorgeous. Can I please win so I look half as glamorous as you do please?!! Congratulations on your one year blogiversary, here's to many more! Happy one year! You've come so far! This is the most perfect give away! I would probably wear with a gold glittery eye shadow! Great giveaway too! I'd go with a natural look, foundation & a little crème blush. That lipstick should stand out! Wow, that is a great achievement, happy birthday to your blog! 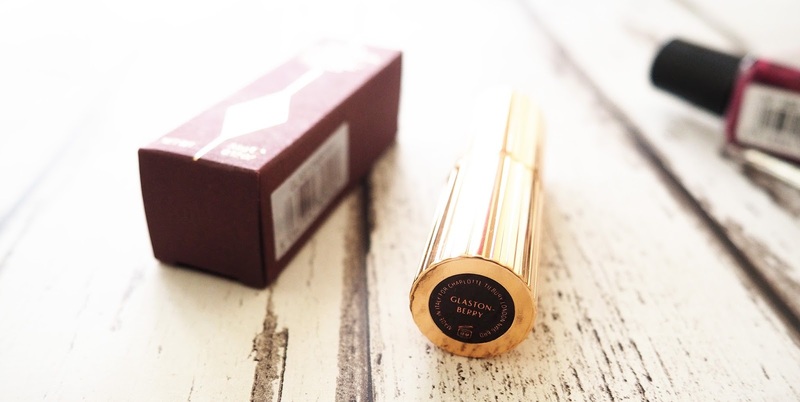 Such a gorgeous lipstick, I've been after it for ages! 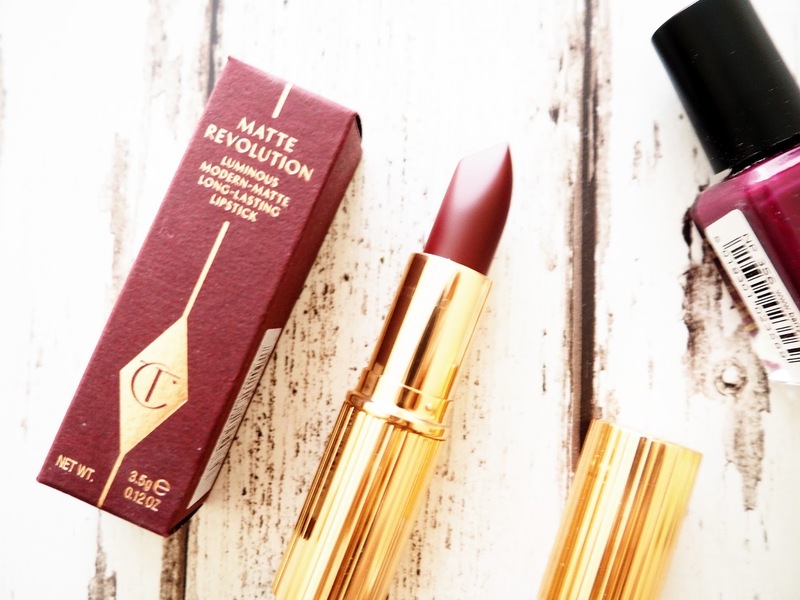 What gorgeous products – I love the colours! I would go for a subtle eye make up – my usual slick of black pencil eye liner and some mascara, and let the lipstick be the main event! This is the most beautiful giveaway! I was just perving on a look Cara Delavigne [wow I can't spell her name] was rocking for fall this morning, when I stumbled across this bad boy and could hardly cope!! A fab black liquid eyeliner with a flick! Happy 1st Blog Birthday 🙂 Very nice of you to do a giveaway in celebration of this!! I'd wear the Glastonberry Lipstick with a gorgeous copper eyeshadow, while rocking a collard, pleated dress for the festive season! Eeeek having seen this in actual real life makes me want it even more! Such a pretty autumnal colour that I'll definitely have to buy for myself at some point 😉 Proud of you for your 1st birthday Kay! Ahh congrats! I love a berry lip with a neutral smokey eye and some vintage winged eyeliner – perfect! Congratulations!! Berry anything is my complete obsession but lips have to take the top spot! I'd go for thick cat winged eye liner with a gold/bronze look and that lush lipstick colour! Oooooh I think I'd go for a simple golden eye with lots of mascara and my favourite burgundy pinafore! Congrants on your blog turning one lovely! You deserve many berry treats yourself! I think it would go well with some black liquid eyeliner. This would be for my other half so shimmery gold eye shadow. Perfect giveaway for this time of year! I would go all out, for my christmas party at work and go with smokey eyes to make it even more daring! I would wear it with a natural eye so the lips really stand out! But it would also lok really great with a golden or bronze eyeshadow look to make it party style!